Raised by his mother in New York City and knowing very little about his Japanese heritage, Ichiro doesn’t feel like he fits in anywhere. He idolizes his father, a soldier killed during a war, and in his honour wears a shirt saying “Kill ’em all. Let God sort ’em out,” which his Grandpa Benny tells him is an army slogan. Grandpa Benny is racist, adding to Ichiro’s conflicted sense of self, being himself half-Japanese yet seeing his grandfather’s anger towards other immigrants. When Ichiro’s mother arranges a business trip to Japan and leaves Ichiro in the care of his Grandfather Sato, Ichiro learns a lot about that part of his heritage. More importantly, he learns that there is much more to war than a strict divide between a good side and an evil side. 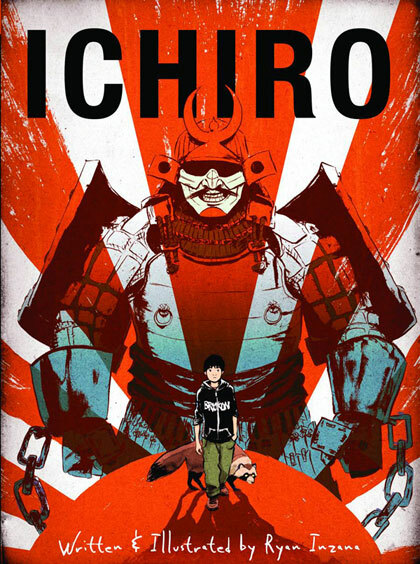 Ryan Inzana‘s Ichiro is an imaginative, textured graphic novel about the nature of war, and about the need for tolerance and open-mindedness. I love that Ichiro explored the horrors of World War II from the point of view of the Japanese. Ichiro’s grandfather explains the historical context behind Japan’s belief in the emperor’s divinity, and tells Ichiro stories about victims of the atomic bomb. Inzana contrasts the horrific effects of the atomic bomb with a scene of teenage boys playing a war video game. “Waste that guy!” a boy exclaims, his friend happily pumping more virtual bullets into a soldier’s torso. This occurs right after images of Ichiro’s visit to a museum about the Hiroshima bombing, and, like Ichiro, we lose our appetite for such a form of entertainment. I have long been aware of the Japanese legend of the paper cranes — if a sick person can fold a thousand, she will be healed — yet, like Ichiro, I never knew that it originated in the historical figure of Sadako, a young girl afflicted by atomic radiation. From identifying himself as primarily American, Ichiro is shaken at what he has seen and reacts by rejecting his American heritage. “How can you not hate America?” Ichiro asks his grandfather, to which his grandfather responds with a Buddhist saying, “Heaven and hell are in the hearts of all men.” That, ultimately, is the point behind Ichiro, that while there are two sides in any war, both sides are equally human, and equally capable of horrific destruction. The point, for Ichiro, is not to choose to be either Japanese or American, but to accept both sides of his heritage. Inzana takes this subject a step further, and infuses his story with Japanese mythology. While trying to trap a persimmon-stealing raccoon, Ichiro is taken underground, into a land of Japanese gods and monsters. The Japanese-American war and its ensuing years of distrust and discrimination are mirrored in the underground war between the mythological lands of Ama and Yomi. Here, the injustice of war is even more pronounced, because we see how so much suffering was caused by a relatively minor misunderstanding. The parallelism turns somewhat didactic after a while, and I sometimes felt that Inzana was trying too hard to get his point across. That being said, I love this imaginative way of portraying how senseless and unavoidable war is, and how horrible its consequences can be. In this land, Ichiro is viewed as a potential spy, making the experiences of Japanese-Americans in World War II all too real and immediate. As Ichiro begins to understand the complexity of his Japanese-American heritage, he faces the threat of being executed as a spy and worries about how he can get back to his real life. I do wish Inzana handled his subject with more subtlety, perhaps by keeping it mostly mythological or mostly realistic rather than creating two parallel, yet equally weighty story lines. However, I do applaud his creative approach at tackling such a disturbing, emotional subject matter in the first place. I don’t know if Inzana’s story about Ama and Yomi are based on actual Japanese mythology, or if Inzana created it to parallel Japanese-American history. Either way, Inzana’s tale reminds me of how and why mythology is created in the first place — to attempt to make sense of situations that seem beyond understanding. With so much horror in history, how better for Ichiro to come to terms with his dual heritage than through mythology? Ichiro is a rich story about a very troubling, emotional past. With so many stories about World War II, it is troubling to imagine how much in common we have with the teenagers happily killing soldiers in the arcade without reflecting on how real such horrors could be. Great graphic novel for anyone who wants to learn more about Japan, or about the Japanese side of World War II history. This entry was posted in Book Reviews and tagged 50BookPledge2012, ARC, Fiction, Graphic Novel, Thomas Allen & Son by Jaclyn. Bookmark the permalink.